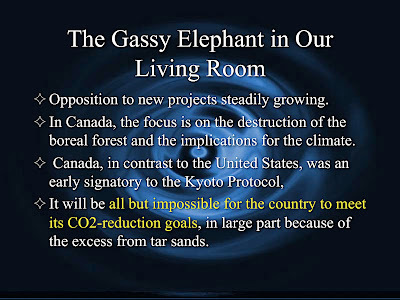 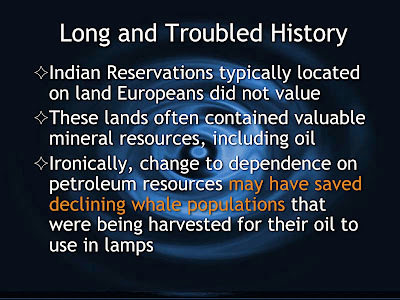 Slide 1: Many of the biggest environmental problems are associated with oil development and exploration. 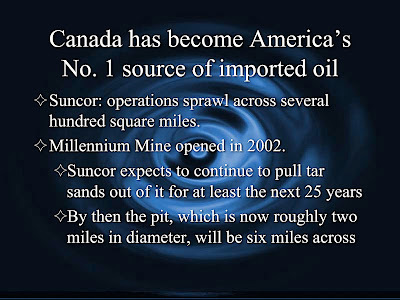 This is because of the careless way in which oil is developed, which can lead to massive spills, such as the British Petroleum blowout in the Gulf of Mexico. 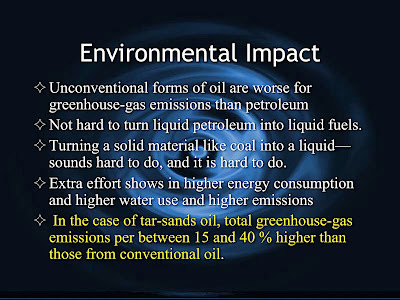 The profits that come from the oil industry encourage greed and carelessness, because the people who work in the oil industry do not respect the environment and the work is dirty and dangerous. 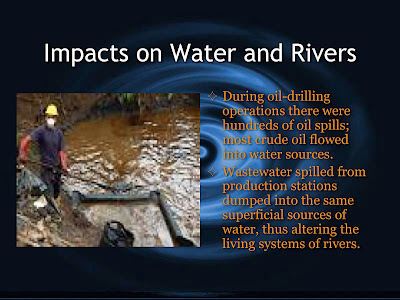 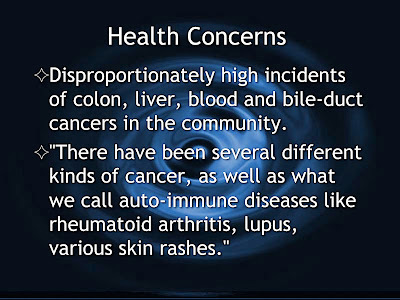 This combination leads to carelessness and quick and dirty fixes that lead to environmental problems. 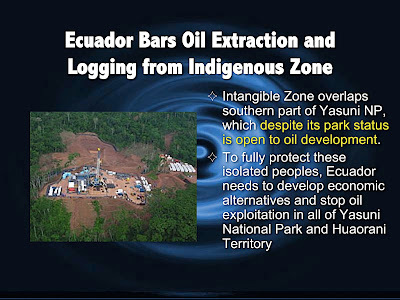 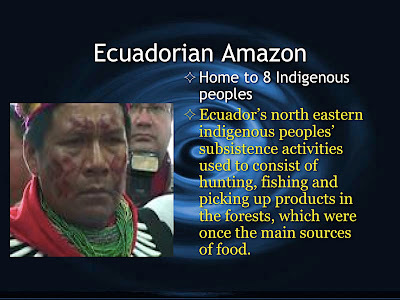 In many parts of the world oil exploration and development takes place in remote areas, such as the North Slope of Alaska, Arctic Siberia, and the jungles of Amazonia, where Indigenous peoples live. 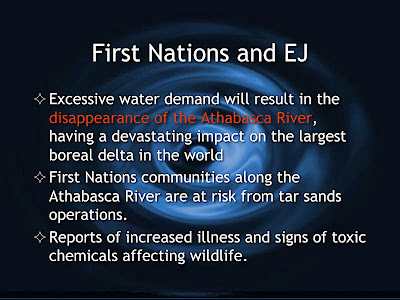 This leads to environmental justice issues because in these areas the oil industry operates on the principle of “out of sight, out of mind”. 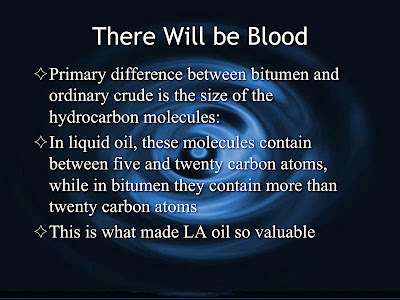 By contrast, consider that one of the major oil producing areas of the US is Los Angeles, as shown in the film There will be Blood. 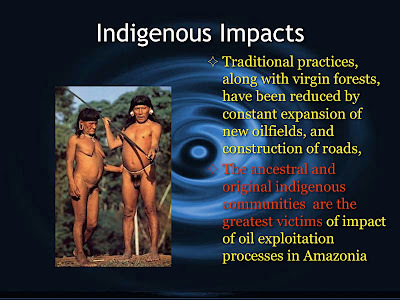 Over the last 50 years there have been no major oil spills in Los Angeles, compared with hundreds of such problems in areas where Indigenous peoples live. 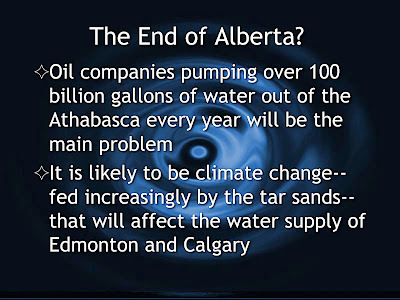 This shows that the oil industry can be careful when it needs to be, i.e. 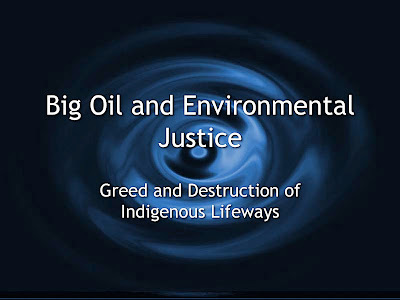 in major cities, which means that their carelessness in areas where Indigenous peoples live is an issue of environmental justice. 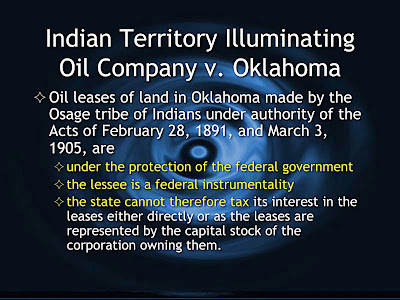 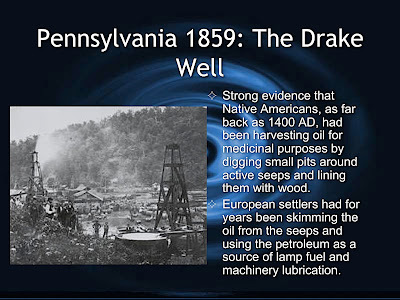 Slide 5: The first major conflicts between tribes and the oil industry arose in Oklahoma, where tribes from the East had been relocated because European colonizers did not value Oklahoma until they found oil there. 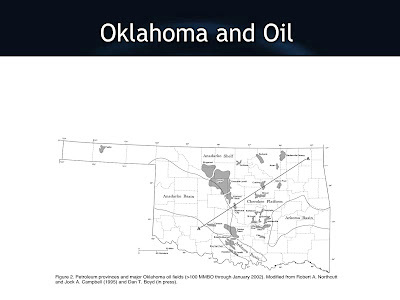 The image shows major oil fields in Oklahoma. 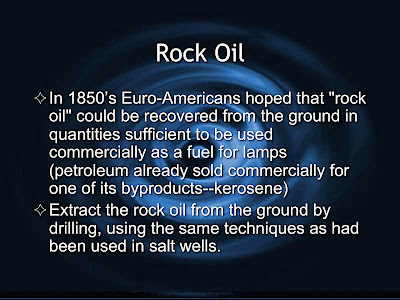 It is not widely discussed, but much of the US Petroleum Reserves lie in Oklahoma, largely because Oklahoma’s central location makes it relatively safe from attack by potential enemies. 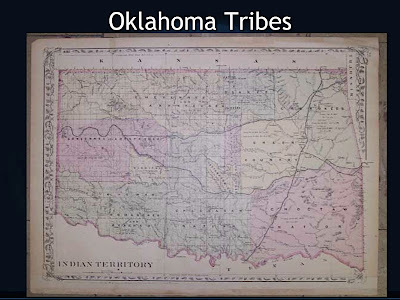 Note that at this time the panhandle was not part of Oklahoma, but part of Kansas Territory. 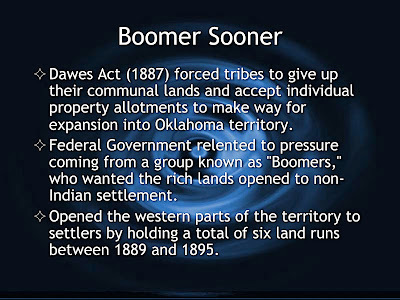 Slide 8: Boomer Sooner, the fight song of the University of Oklahoma, celebrates the Oklahoma land rushes of the 1890’s which were set up to allow Europeans to take land not allocated to Indians as a result of the Dawes Act. 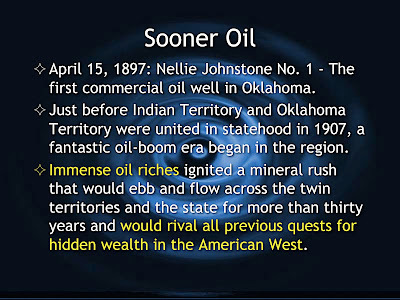 This was the Oklahoma land boom, and those Europeans who sneaked in early to claim land were the “Boomer Sooners”. 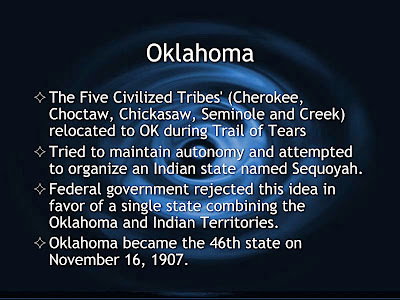 This was originally a pejorative term directed at cheaters, but today it still symbolizes the attitude of many non-tribal people for Oklahoma, i.e. 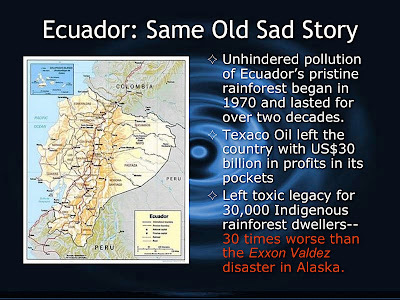 greed and cheating. 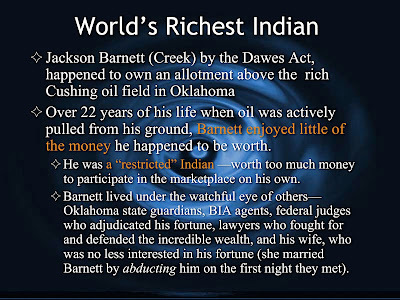 Slide 11: Source: The World’s Richest Indian: The Scandal over Jackson Barnett’s Oil Fortune. 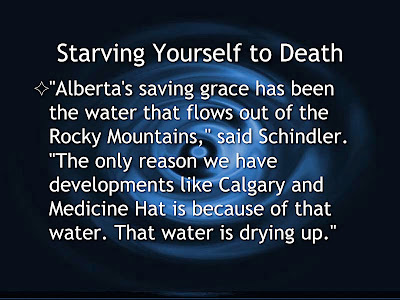 By Tanis C. Thorne. 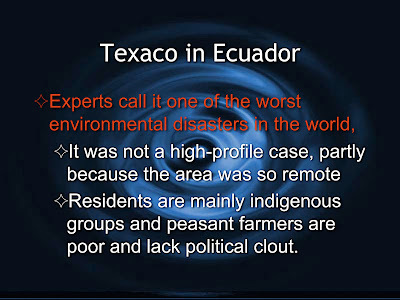 New York: Oxford University Press, 2003. 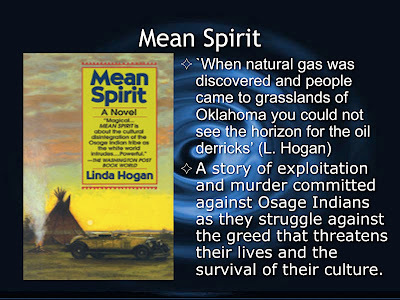 Students or faculty interested in the social dynamics of this activity should read Chickasaw author Linda Hogan’s award-winning novel (1990) Mean Spirit, Atheneum Press, NY, NY., which deals with the Osage Tribe and oil. 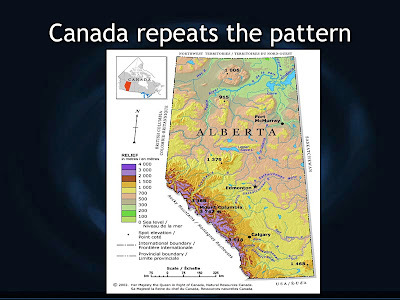 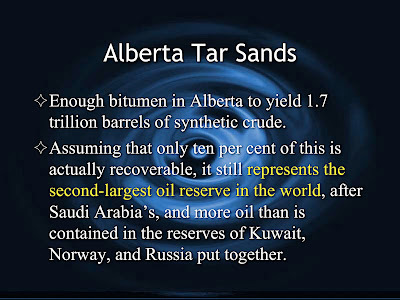 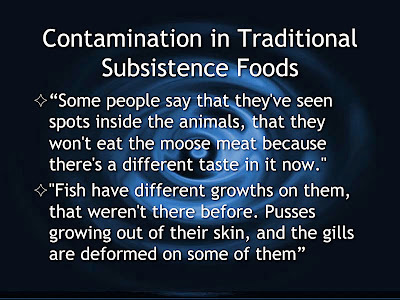 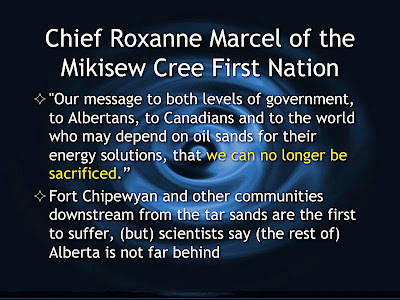 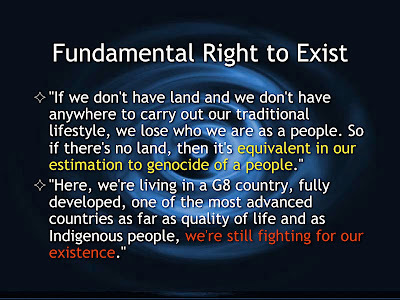 Slide 19: One of the most destructive forms of oil extraction has taken place in the Tar Sands in remote areas of Northern Alberta, where the population is mostly indigenous peoples. 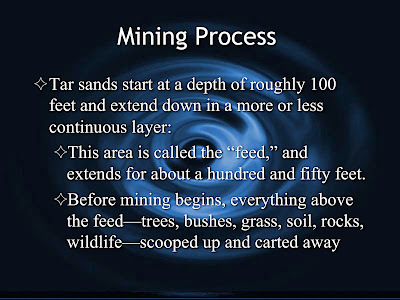 Slide 27: As with Peabody Coal on Black Mesa in Arizona. 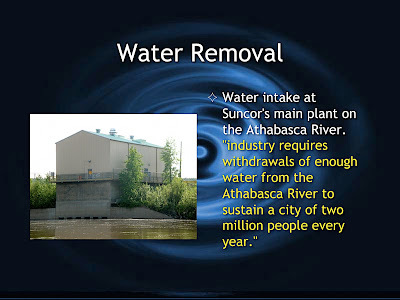 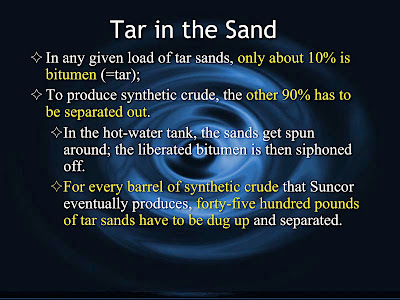 Processing of tar sands requires huge amounts of water, enough to destroy major rivers.